It looks like the swift boat ad is working. Kerry is now dropping in the state polls as well as in the national polls. Bush claims no involvement while his top lawyer, Benjamin Ginsberg, admitted he advised the swift boat vets and resigned. Dirty tricks that leave no fingerprints are nothing new to Karl Rove, but what is surprising is how unprepared Kerry appears to have been. Specifically, the Los Angeles Times reports Bush leading in Missouri 46% to 44%, in Ohio 49% to 44%, and in Wisconsin 48% to 44%. 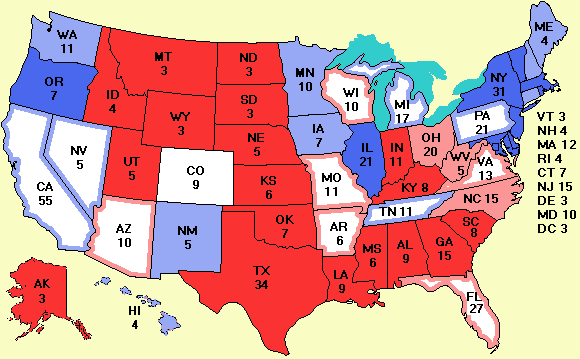 Wisconsin was leaning towards Kerry and Missouri was tied, so Bush picks up 21 votes in the electoral college from these two key states. It was almost better or worse, depending on your perspective. A new IssuesPA/Pew poll in Pennsylvania has been released as well. Two results were given. Among registered voters, Kerry leads 45% to 43%, but among likely voters Bush is ahead 45% to 44%. I will use the LVs even though that favors Bush (I am pro Kerry but also pro honesty). However, this poll was conducted concurrently with the Zogby poll I posted Tuesday, so I will average the two, as I always due with concurrent polls. This gives Kerry a 48% to 45% lead for the moment. If the race remains as it is now (fat chance) and Bush picks up Colorado, which is now tied and the referendum there fails, Kerry wins 270 to 268 in the electoral college because 270 is the magic number of electoral votes it takes to win. If one elector can be bought, it becomes 269 to 269 and the Republican-dominated House picks the president. How much do electors cost? If you want to make sure your vote isn't eaten by a malfunctioning or hacked voting machine, you can vote by absentee ballot. The Washington Post reported on the rules for getting an absentee ballot. In every state west of Missouri you can get one by just asking for it. You don't have to give a reason. In some of the states in the East, you need a reason, such as a business trip planned for election day or being unable to get to the polls due to age, infirmity, not having a car, etc..